Note that the first known use of the word Money in the English language was in the 13th century. The word Currency didn’t make it into the English language until more than 400 years later. From our deflationist friends like Mish, Karl Denninger, The Privateer, Rick Ackerman and others, we are learning every day that the world economy is shrinking in a crushing deflation of asset values, production cuts, job losses, bankruptcies, and demand destruction that is likely to continue for many years. From what I can tell, this is all true. And from our inflationist friends like John Williams, Jim Sinclair, Peter Schiff, Jim Willie and others, we learn that hyperinflation is a currency event, not an economic event, that the Fed and the Treasury are massively increasing the money supply and the national debt, that the US Treasury market is in a bubble phase, and that the popping of that bubble could trigger a hyperinflationary event. And from what I can tell, this is all true as well. So in this post my intention is to bring these two seemingly different opinions together in one unifying explanation. A truism that we have all heard is that in deflation, “cash is king”. But according to Webster’s, cash is "ready money", not necessarily ready currency. There is a difference that this post will show. But to clear it up in our Western minds, let’s think of this truism as “in deflation, MONEY is king”. Most of us are completely immersed in the Western mindset. This is the mindset that sees all value denominated in US dollars. This is how we have known all things since birth. We lack experience, the experience of loss of currency. In other cultures people learn to cross-value things. In our Western culture we are taught to value things in dollar terms first in order to compare values. This will be a true handicap in the years ahead. Please understand that money, whether it be paper, metal, sea shells or fur pelts is only as good as the perception of value in the minds of men. If all the gold on earth became known as money, it would be used to revalue every real thing at a fair price. A tiny fraction of gold would buy much production of goods and services, on an equal basis for ALL men, not as a debt for later settlement as currencies are now. For us Westerners, we first have to think, “how many dollars is this worth?”, and then “how many dollars is that worth?”, in order to compare the value of two things. So one could ask, if we only know value in terms of paper, can we really know value at all? We think, what can I buy today for the lowest price? But in the modern world economy, the lowest price is a function of currency exchange rates. If the Yen falls against the dollar next year, Japan will offer its televisions in America at a lower dollar price. So which value is correct, the price today or the price a year from now? The point is that all value judgments today are subject to exchange rate competition. And it is in this paper exchange rate environment that we denominate our net worth. Is this a safe way to hold our wealth for the future? We should ask an Icelander or an Argentine. Everything in life is relative. What this means is that every valuation we make must be made against something else. The concept of FreeGold refers to the emergence of a fair and true valuation of gold against all things, in the absence of government controls or price manipulation. 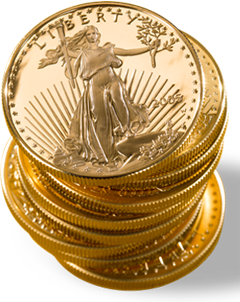 FreeGold is completely separate and free from hyperinflation. We may see either one or both in our future. I argue that FreeGold is inevitable some time in the near future. I also argue that hyperinflation is approaching inevitability. On our current course it is inevitable. But neither one of these concepts requires the other one. And while FreeGold should be celebrated, hyperinflation or currency collapse should most definitely NOT be celebrated. It is a horrible thing to witness, especially first hand. FreeGold can exist just fine along side a functioning paper currency. The currency is used as stated above, for buying, selling, earning and paying, and gold is used as a store of wealth par excellence for the common man. So it is with great sadness that I watch our leaders destroy the currency when it does not need to happen. Currency collapse and hyperinflation are two sides of the same coin. When a country experiences hyperinflation like Weimar Germany or Zimbabwe, that experience is the collapsing of the currency. And likewise, when a country experiences a currency collapse like Mexico, Argentina or Iceland, a hyperinflation of prices in that currency is what is experienced by the people. It is very common for people living in these countries to receive US dollars sent to them by friends or family living in the States. This gives them a tremendous advantage for survival. The question is, who will send us money when the US dollar is no longer any good? The reason I posted the hyperinflation videos yesterday was to demonstrate that the ground level experience of a hyperinflation looks a lot more like the Great Depression than a period of high inflation like the 1970’s in America. The reason is that really the only thing inflation and hyperinflation have in common is in the name. Inflation is normal in a fiat money system. Deflation and hyperinflation are both abnormal states for paper money. For contrast, deflation in a strict gold currency shows economic growth. But with paper currency, mild inflation is what you want. The answer is yes, we CAN have a deflationary depression AND hyperinflation at the same time. And I DO mean hyperinflation both in money supply and prices. Now denominate the price of “assets” in this new “money”. The assets I’m talking about would generally be considered luxuries, and would include anything and everything not needed for survival. Boats, stocks, bonds, big screen TV’s, computers, etc… will all continue to decrease in value when measured against real money. Denominate like this. A house costs 100,000 packs of cigarettes. Or a boat costs 60 ounces of gold. Or a 60” plasma TV costs 3,000 cans of peas. Deflation means that the price of these non-necessities will decline in “real” terms for probably the next 10 years or more. Necessities will be the first items in which we will witness the arrival of hyperinflation. These include at the most basic level, food, bottled water, and other gear that usually shows up on survivalist lists. These are the same things I am calling “trade goods” aka “money”. Remember, in deflation, “money” is king. In dollar terms, these items will skyrocket. Then soon after, in dollar terms, assets or luxuries will also follow. But they will lag, and they will rise slower in dollar terms. But in real terms, those assets will continue to decline. Remember, everything is relative. Let go of Western dollar-based thinking. Houses are a little different. They are essentially a commodity and a necessity. However they are still in a bubble deflation, and the fact is, recently built homes exceeded the size needed for survival. So they will continue to decline in real terms until they reach a certain equilibrium, then they should start climbing in price along with other trade goods and commodities. In our previous issue, the headline which began this page was: “Nowhere To Go – But Back To MONEY”. The only “collateral foundation” which remains under the US Dollar (and all fiat currencies) is its continued acceptability as a medium of exchange. The only “collateral foundation” which remains under US Treasury debt paper is its continued acceptability as means of “storing” unconsumed wealth. Bizarre indeed. What the article did NOT ask was a very simple question. Why would anybody keep money in a bank which is in existence solely due a government bailout and which guarantees in return that their savings will grow smaller the longer they keep them in that bank? Clearly, the UK Pound is not worth saving and its huge dive on currency markets over the first week of 2009 illustrates that fact. With official US rates now at ZERO, the US Dollar is “not worth saving” either, as we maintained in our last issue. Right now, people have come to their senses or have been forced by circumstances to curtail their consumption and start at least attempting to save. As the year progresses, the question about WHAT to save will grow. The Privateer will be keeping a very close eye on this one as the year progresses. I have the answer for The Privateer. SAVE REAL MONEY. Remember, in a deflation, cash is king.” And cash is “ready money”. And money is “something generally accepted as a medium of exchange, a measure of value, or a means of payment.” And in the very near future, gold will be the best example of this kind of real, ready money. I don’t mean to sound like a broken record, but it is our Western perception that makes us think only in terms of dollars. And it doesn’t help that during the Great Depression, dollars DID rise in value to a degree. But back then, gold was made illegal in America, yet still backed the dollar internationally. So that is a poor example to base our thinking on in today’s crisis. An excellent “portfolio” right now would contain a lot of gold, some smaller denominational silver, a full pantry of non-perishable food, plenty of bottled water, a generator, some back-up gasoline, and many other things that I’m sure you can figure out. These will all maintain their value. Some will gain much value. They will also serve a purpose in your life and those that are close to you. I have said this before, but gold is money par excellence. If you have gold, you will be at the top of the new food chain. Anything that you forgot to stock up on will be obtainable if you have gold. This is my answer to The Privateer. There are some obvious events that could trigger the onset of hyperinflation. A collapse of the bond market, or even just the US Treasuries market could do it. Any kind of a panic selling of dollar holdings, or paper investments, will signal a shift in confidence. The Chinese or one of the many other holders of our debt might decide they want out. This is similar to the bond trigger. A food shortage or a gas shortage could cause panic in the people. A large crash in the stock market, or a Force Majeure being declared by our leaders, leading to a de facto default on the COMEX could do it. There are other potential triggers which are less likely that relate to actions taken by other governments like Russia or the Middle East. But the bottom line is that there are so many possible triggers, that I now believe a currency collapse/hyperinflation of the US dollar to be almost unavoidable. There is not an easy answer to this, because it will likely surprise almost everyone, including me. But I do have some thoughts. Watch for a “bond crisis”. Watch the shelves of your local supermarket, especially canned goods, dry goods, and bottled water. When shortages come, hyperinflation won’t be far behind. When the government finally imposes price controls, it is already here. Listen to the news. Take the pulse of the public’s state of mind when it comes to shortages of food, gas, or any other necessity. Panic is the key. Watch for a large spike in the price of oil. This could happen soon after an eruption of violence in the Middle East, or a large failure of the stock market in New York. I could go on and on, but if you get the picture, you can develop your own list. Obviously the answer is no. But get prepared. This is fairly easy to do right now. But once it starts, it will be very hard to prepare. Preparation must be done before the dollar collapses. When historians look back on this chapter in our existence, one thing will be clear: That a massive transfer of wealth took place. The transfer was from those who held paper wealth to those who held REAL wealth. And I will say it one more time, gold is real wealth par excellence. It is not the only real wealth, and it is not the only money. It is simply the best. Whether you buy the idea of FreeGold or not, to own gold right now is to not only be prepared for any situation, but to put yourself on the receiving end of the transfer of wealth that is coming. True and fair valuations can only be analyzed in hindsight. So it is imprudent for me to put a true FreeGold valuation on gold at this time. But I have done so in previous posts on this blog, and bear in mind that those valuations are PRE-hyperinflation. I believe that history will show that these coming years were a time of massive deflation, when measured against the true valuation of gold. Yet at the same time, history will record a hyperinflation of the world’s reserve currency, and possibly ALL paper currencies during this same deflationary MASSIVE depression. I do not relish this, yet I see it coming quite clearly. So the best that I can do is to prepare for myself and my family and to help as many others as I can to prepare. And if you prepare smartly, you will still profit from the experience even if (by very small probability) I am wrong. Much of this Western Perception section was paraphrased or directly copied from here. My intention was to make the point without quoting Another. It was not plagiarism. I could not more agree with you than this writing, it is just "BRILIANT"
Normal inflation is, as you say, healthy for the economy as it stimulates people to invest rather than to save money. It promotes de-hoarding of paper wealth if you will. It is a technical necessity, a weak mediator. Hyperinflation is a rapid devaluation of one currency vs. the other currencies as per historical experience. It is an event caused by large socio-economic problems and pressures from within that have not been addressed for a long time. Lets forget about conspiracies where this is engineered. We gain nothing from discussing that. In Zimbabwe, you cant afford things that are imported since Zimbabwean importers have no foreign exchange currency to pay internationally. Also the state has no reserves. It is also what happened in Jugoslavia where I lived as a kid: we had a short period of hyper-inflation just before the break-up. I remember that there was a very large demand of foreign valuta to settle payments but prices denominated in that currency (german marks in that time) were not rising, even falling a bit. Nobody thought in terms of the domestic currency anymore, it became irreleveant. All was valued in DM and this continues even up to this day (in euros) almost 20 years later when there technically is normal inflation in the local currency. Large purchases, like cars or houses, are still marketed, negotiated and valued in euros. The form of the final transaction does not matter. What I want to say is that a hyperinflationary period is an event that threads deep in the society, it changes mindsets. It creates a type of distrust in authority that cant be cured. It is a traumatic event on a national scale. However, we never had a hyperinflationary period on a global scale. There will be no fiat currency on the other side of the comparison. What that will mean is that other media of valuation will have to rise relatively to the fiat currencies so that we can define hyperinflation. The global currencies then become irrelevant and are just a technical inconvenience at the end of transaction. There is a silent revolution going on where people start to refuse to take part in the fiat's money wealth function. They simply refuse to buy new cars or houses citing concerns over the economy. But what is actually going on is the realization that valuation in terms of today's money is very relative and prone to manipulation (bubbles, as per your posts last/this week), it is out of their hands, it is not subject to normal free-market behavior. Scams like Madoff, the moral hazard of bailouts, volatility in the markets, the failure to reckognize and act on injustice, massive disappointment from elected leadership (Bush, neocons) all just reinforce this new. The trust is ebbing away. The risk of having your wealth taken away by the instabilities in the system outweighs the necessity of the new purchase. So, I also propose that global hyperinflation, as far as experiences of the people is concerned and not technicals, is equivalent to depression. It is not necessary for prices to rise exponentially, all that is needed is for the centrally issued money to become irrelevant together with the leadership. The stimulus package. The idea is for the government to centrally start great projects, by indebting itself, that will increase industrial demand and stimulate the economy. It is a good idea and in theory it should work. But, if that is so, why dont other countries embark on such a strategy to combat poverty? Why would it work in the US and developed economies and not in third-world countries? The answer is that some countries can indebt themselves with ease and others cant. If Angola tried this, who will buy their bonds? Who has faith that the projects will be well-managed and that at the end there will be a viable industrial infrastructure and industrial growth in that country? Even more, who has the faith that the Angolan local markets are indeed governed by a healthy supply-demand law? The same is valid for the US. Who has faith that the government is managing it well and the "free" market will work its miracles? Will it not be easier to assume that once a great demand in industrial commodities, products etc. is projected or expected in the future, the speculators will crowd the markets and destroy the normal price discovery system? Just like in the oil bubble when speculators have overidden the normal price discovery mechanism (demand-supply disturbed). Who has the faith that Wall street will not again accumulate the lions share of the stimulus money with scams and manipulations? It is naive to think that it will be alright. Dont forget that if the stimulus does not produce GDP growth but inflation or another bubble, the game is over. They will have no tools left. I am in complete agreement with you, especially about viewing a currency as just another trade item with a value relative to the value of other things, particularly useful necessities. It's obvious that we are seeing deflation in certain areas, especially the asset classes that were bubblized during the past decade or so. That deflation, however, does not imply universal deflation of prices across the board. We could easily see house prices plummeting while food prices are soaring. In fact, I see that now! And as you intimated, hyperinflation is really a confidence issue. It's not just a bad case of inflation. People can easily lose confidence in the currency at the same time that their confidence in houses as investments continues to erode. In such a case, both houses and currency will continue go down in value together, until houses reach a bottom, whereupon their prices will begin to hyperinflate along with those of other real goods. Currency, of course, having no tangible value, can continue approaching zero. I find the ongoing debate about deflation/inflation irrelevant because I believe it's not an either/or question. We can have both simultaneously. One observation that I keep returning to is that all these trillions of dollars being lavished on the financial system have to have some consequence. You simply cannot create trillions of dollars like that with no consequence. I can't predict exactly what those consequences will be. It could be run-of-the-mill inflation; it could be a domestic loss of confidence in the currency that leads to hyperinflation; it could be an international loss of confidence that leads to hyperinflation; it could be hyperinflation that starts elsewhere as countries try to maintain their dollar pegs and which then returns to the U.S. I don't know, but there has to be some consequence. Regarding your first comment: I believe it matches my thinking. Your "new purchases" which will be boycotted are what I call "luxuries", or non-essential goods. But people will still need to buy necessities. And in necessities we will see a vicious cycle of exponentially rising prices. I think we will be very surprised at the ways our money printers find to distribute newly printed currency. Ultimately, though, even those unwanted luxuries will also rise exponentially, simply because you can't have a $60K boat when toilet paper is $100 a roll. In Zimbabwe, a nice boat costs quadrillions of Zim-dollars, and that is a much-deflated value even though it is a hyperinflated price. Regarding your second comment: All that Government "stimulus" projects do is give the government a way to pass out new money. They add nothing to the wealth of a country. Just the opposite. They put people to work on make-work projects that could instead be working on creating new value. And funding these projects with debt takes valuable capital away from people in the future through taxation. It is all just a reshuffle of resources. Nothing new is created. What this country needs is to produce real value once again so it can start to level its trade deficit with the rest of the world. Sure, the government might build a new bridge, but all that does to the trade deficit is to remove labor from the private sector where value is created, and to remove capital from that same sector in the future. It is all a big hoax, meant only to get the morons elected again in a few years. All the stimulus and bailouts are exactly the wrong thing to do. On this, Karl Denninger is right on the money. What they need to do is clean house and take some pain now, to spare the pain of death later. Infrastructure is important, but in a healthy economy it is maintained from the excess produced by the value-creating private sector. Govt. projects should never become the central focus of an economy. All that does is to drag out the pain much longer than necessary and in the worst case, it could mean the political end of the entire system. Of course most of the "stimulus money" will be stolen from us. Just look at the projects it is going for. It is all one big exercise in political masturbation. For GDP to be meaningful, it needs to measure real value added to the economy. If you dig one hole just to fill another, have you really increased the GDP? Did you change the name of your blog? Thanks for the comment. You and I are pretty much on the same page. Although I don't have much hope for run-of-the-mill inflation. That would be a rather healthy outcome and I think that is pretty much impossible at this point. You nailed it with the word "consequences". That is the key. They cannot be avoided by short-sighted quick-fixes. I think about this a lot, and two things seem very clear to me. A healthy and good outcome is simply not in the cards anymore. It's just too late. And second, the money-printers are not going to be able to print new money of ever-increasing value for much longer. And when you add those two up, the possibilities are downright terrifying. I keep thinking about that discussion we had on feedback loops. I think that applies in spades right now. This article clearly reflects an AMERICAN and NOT a WESTERN mindset. We europeans are always interested in the e.g. the EUR/USD exchange rate because a lot goods/commodities are priced in USD and the EUR/USD exchange rate can have a VERY large impact on prices of goods in EUR. CB's wil do wathever they can ofcourse to devoid collapse although theire measures take unfortunetly too muche time. Seems to me we are beyond that point already. Ofcourse the (wise) men are looking for sollutions, and the best would be with pulling the GOLD back in its function as the ultimate "store of wealth" at the base of the reversed (Exters) piramide. The longer they wait, the more devastating things will happen at accelerated speed. No, my blog name is the same, I've just begun using a more "stylish" link to it. I agree that we're seeing something reminiscent of an unstable feedback loop, especially with respect to the ever larger stimulus measures (control) being thrown at the problem. I think you and Karl are correct. The only way out of this problem is to write off the debts and overpriced securities, let companies go bankrupt, let companies trim down, let people go bankrupt and lose their homes, let house prices collapse, and so forth. Painful as those consequences would be, it's less painful than what will happen as a consequence of trying to maintain what we have today, which at best will be a prolonged downward slide that will leave us in exactly the same place anyway! Better to get it over with quickly, purge the rot from the system and hopefully find ourselves positioned sooner for a recovery. That said, however, I have to think that "this time it's different," so I'm not even looking for a recovery. Remember the "jobless recovery" that baffled everyone after the 2001 recession? That's kind of what I see ahead, but on a larger scale. Between decimating our manufacturing base, destroying the entrepreneurial spirit in this country, and peak oil, I honestly don't see any real "recovery" ahead even if we purge all the burdensome leverage. What I see is "coping" with increasingly difficult circumstances. During deflation of asset prices, confidence in paper assets (debt claims) are questioned and they are impaired and sometimes removed from the system as the deflation gets worse(confidence deteriorates). Capital claims cannot be removed from the system by deflation and deflation can also generally not impair its usefulness. The paper value of capital claims might be impaired but that does not mean its underlying value (usefulness) is impaired. There have already been a few currency failures or impairments during this crisis and it might continue and in the extreme lead to the death of the dollar and other major currencies; and therefore the end of the world monetary system as we know it. If deflation of asset prices continues, more and more debt is removed from the world financial system. In fact the market is trying to get rid of the debt in the world financial system. Remember that all paper money is also debt, it is not capital. Paper money is a “debt claim” on tangible assets, parading as a real (capital) claim. Let me explain the difference between a debt claim and a capital claim with an example. 1. M Botha has a farm that is paid up. He exchanges his farm for a big house in the city. He therefore has traded his claim on the farm for a claim on the city house. Both claims are capital claims, and they provide stability and confidence. The chances of him losing the house or farm are small. 2. M Botha has a farm that is paid up. He buys a big house in the city which he finances with a loan from the bank. He has a capital claim on the farm but he has a debt claim on the house. (Note this is exactly how paper money is created, by credit extension). What is different here to 1? Stability and confidence is threatened since his chances of losing the house is greater than in 1. Keeping the house is dependent on him being able to pay the bank as his obligations become due. If he cannot pay then the credit is removed from the system and the house is repossessed/sold off. The result if he defaults is less or no debt and eventually a lower asset price. Note that the value of the debt claim is dependent on his or the bank’s confidence that he would be able to pay his obligations. The value could eventually fall to zero should he default or the bank recalls the loan. In the same way the value of paper money is dependent on confidence. In 1 above the capital claims are not subject to this risk. So in the extreme, if deflation of asset prices should run its full course (which the central banks want to prevent), there will be no debt and no more paper assets (including paper money) in the system and therefore also no prices in paper terms. All that will be left standing is tangible assets and therefore assets will be priced in terms of other assets (barter). The paper prices of tangible assets will have first gone down until pricing in paper terms will become meaningless or non- existent. However assets that have monetary properties will trade at a premium because they are more useful when moving from one asset class to another. Therefore gold and eventually silver will shine even more. So a word of advice: if deflation continues remember to stop looking at paper prices when evaluating your wealth and making economic decisions, but rather look at how much tangible assets you have (You should do this in any case, irrespective). To read more about this you can follow this link. We can already see that this is what has been happening since deflation of asset prices has taken a hold of the world economy. Initially gold was falling with other commodities against the dollar, however as the crisis continued gold started to behave differently to other commodities, and has until recently actually made up those initial losses against the dollar. This is just the beginning phase of a falling confidence in paper assets. What we do not know in this crisis is how extreme could this deflation get and how “successful “(in preventing deflation from running its full course) the central banks' various interventions will be. Inflation of asset prices is no different to deflation of asset prices in that when it runs its full course (that is the end of hyper inflation) the only things left standing are tangible assets. Paper currency is then worthless thus it is no more, as well as debt denominated in that currency is worthless and is thus no more. Prices in paper currency terms are naturally also no more. In fact the currency is gone because no one wants it anymore. All assets is then priced in terms of other assets (barter - look at Zimbabwe where there is increase in barter). Assets that have monetary properties will trade at a premium because they are more useful in asset exchange transactions. Therefore gold and silver shines even more. So if the central banks manage to avoid deflation of asset prices we will have high asset price inflation which will push gold prices extremely high. 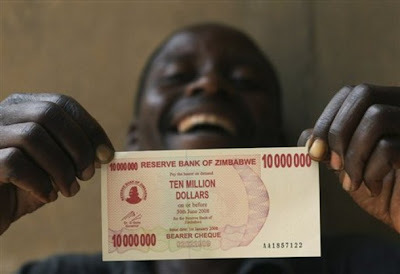 What we do not know is whether their intervention will cause hyperinflation that leads to the death of paper currency. Gold is money. Real money maintains its purchasing power. Real money is a hedge against the inflation (increase in credit and paper money supply) and its effects as well as deflation (decrease in credit and paper money supply) and its effects. Gold is a hedge against inflation and deflation otherwise it would not be money. Open The Mint To Gold!